Echuca Pump Shop has been providing all water filtration, irrigation and water treatment products and services to the Echuca region since 1983. Whether you're a home or farm owner requiring a water system, the friendly staff at Echuca Pump Shop can help you choose the best system for your needs. Our range includes sprinkler systems for small to large areas, pool pumps and filtration systems, to irrigation (including drip and micro, lateral centre pivot and travelling irrigation systems) and grey water systems. 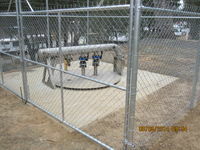 Echuca Pump Shop can design and install a system to suit domestic, commercial or industrial needs.